I am having a lovely Sunday doing lots of things that I have been meaning to do for ages like back up all my camera pics and little bits of domesticity that are not too taxing. It is at the moment a lovely sunny Sunday so they may even be a chance for gardening later (once I am out of my dressing gown – do not want to scare the neighbours!). I love Sundays during the winter months – we are so rarely here during the summer due to all our events so it is lovely to be inside all warm and cosy with the prospect of knitting and DVDs later on this afternoon (hmm ….. Little House on the Prairie or Tudors Season 3 – decisions, decisions…..). I cast on for the head of the teddy I am making last night and so far so good so may be able to show you an item that looks like a bear later in the week! I do love being at home even though I love travelling. 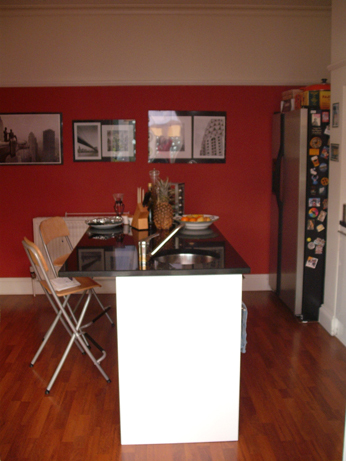 I am lucky enough to live in a very nice house – the kitchen is especially lovely so I though I would share some pictures of it with you so you can see the hub of my domestic creativity. I love looking at pics of other people’s houses on blogs (satisfies my inner curiosity!) so thought you might like to see some of mine. I have to say this niceness is very little to do with me – the whole thing was remodelled by the previous owner and was one of the main reasons I bought this house. It is an old house – about 100 years old and is a stone built terrace that looks very traditional from the outside. It has all the original features in the hall and lounge which I love and you will have seen pics of the lovely fireplace, mantel and hall if you have looked at my Xmas decoration pictures. But then you go though to the back of the house and see the kitchen. Very much a TV cooks kitchen where I can pretend to be Nigella and Delia! The only thing that I did when I moved in was to paint the central unit and the back wall red as I felt it needed a bit more colour and add some pics . 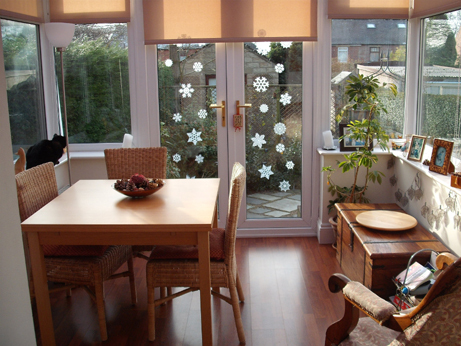 This is what used to be the old dining room of the house – the old kitchen is now a utility room and a conservatory was built on to be a dining room. The dining room is my creative space for large projects and sewing and is one of my favourite places to be as it has a lovely view of the garden – my cat Blackberry also likes being in here – in the above pic you can see him sitting in his favourite place on the left hand windowsill above the radiator watching the birds! The kitchen looks very funky from the dining room. 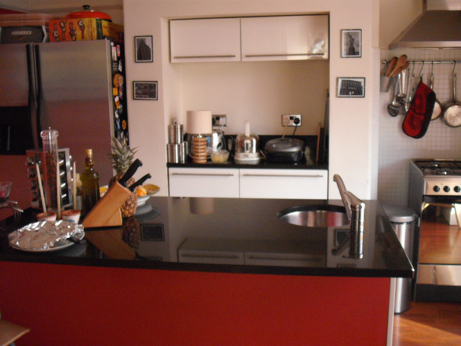 The black marble worktop on this unit is great for cooking as I have loads of space to work and good for pastry as it is always cool but a bit of a nightmare to keep clean – it shows every mark! The pictures on the wall at the back are of the New York skyline in the 1920s which is particularly significant to the story of moving into this house. I like to decorate my rooms in themes and the look of the kitchen immediately suggested New York loft apartment to me when I came and did the viewing. That in itself was significant as I was off to New York the following day with some friends from the medieval group on a hen weekend. I had been trying to move house for some time and had put in two offers on other houses which had fallen through due to not being able to sell ours in time. This property I spotted when we were on the way out one day – being in the next road along from where we used to live – so I arranged a viewing the evening before I was due to leave. I really loved it so ended up ringing the estate agents the very next day before I flew to New York and putting in an offer. A very tense 3 months followed where I thought I had lost the house for various reasons and we ended up temporarily homeless for a week as we had to move out of the old one before we could move into this! However it all worked out very well in the end. When we first moved here four years ago I didn’t have a much time for cooking as I do now due to the general busyness of work and family life. However my job role has changed and I am now no longer out in the evenings and with just me and Jake here the housework is reduced so I am very much enjoying the time to use the kitchen outside of parties and special occasions. 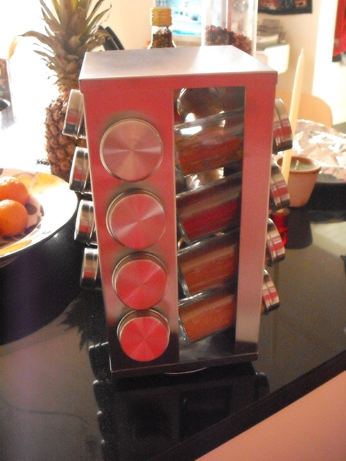 I have just bought a new spice rack as I am doing so much more cooking – previously they were all in a cupboard and it took ages to find things but now everything is at hand! So that this post is not all about the house I shall now share some more stitching. I thought I had finished putting up pics of the gifts I made for Xmas then realised that I had not posted those of the jar decorations I made. My brother’s partner, Amanda, makes the most fantastic jams and chutney so I gave her and Ben, my brother, a jar of my Nigella’s Chilli Jam each for Xmas alongside their other pressies and also decided to make her some little decorated bands for jam jars. 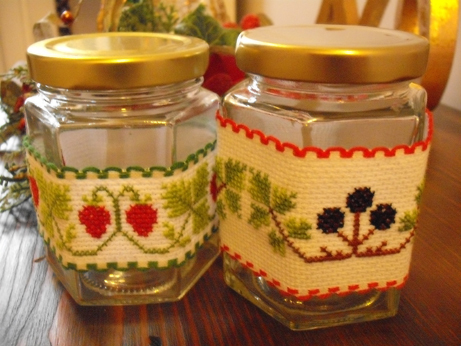 The patterns came from one of my very old Cross Stitch mags and these were a great quick stitch. I bought the aida band at the Harrogate Show. Ellie also stitched one as well for Amanda but unfortunately I do not have a pic of that. Well thank you once again for visiting and hope that you had a happy Sunday!